If you’re looking to move from paper to pixels, a Bamboo Splash is a must-have. You can replicate pencils, chalks, oils and watercolors as you move the Bamboo pen naturally across the tablet. Everything you need to get started is right in the box, including an exclusive suite of software. Just bring your own inspiration! Sketch, draw and paint on your computer with the new Bamboo Splash. You’ll work both digitally and naturally, thanks to the feel of the Bamboo pen in your hand. Whenever your art and your computer come together, a Bamboo pen tablet is a must have. You can replicate pencils, chalks, oils and watercolors as you move the Bamboo pen naturally across the tablet. Create your own effects, experiment, and share your work with others digitally. 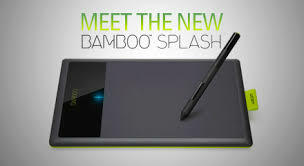 Learn new techniques, explore your interests, and have fun with your Bamboo Splash pen tablet. Includes valuable software in-box: ArtRage® 3 Studio, which provides a set of painting and drawing tools that simulate familiar, real-world tools and lets you try out a wide range of different artistic styles in one easy-to-use application and Autodesk® SketchBook® Express – leading sketching application for visualizing your ideas, light sketching and doodling.